There have been many fine, and some great, landscape photographers in Australia, but three post World War II European immigrants have visibly reshaped the current image of the country as an environment to treasure. Olegas Truchanas, who came from Lithuania in 1948, and Peter Dombrovskis, who was born in a displaced persons camp in Germany and arrived in Australia in 1950 as a child of five with his Latvian mother, were refugees who settled in Tasmania; Richard Woldendorp (b. 1927) migrated from Holland to Western Australia in 1951 to re-establish a life and education disrupted by the German occupation and military service. Through their repeated journeys into the Australian bush, their sense of displacement and disruption was overlaid by a passionate bonding to the physicality of their new homeland. Possibly Australia's open space and undisturbed environment symbolised an integration their European world had lost. All found personal peace and identity by being in the landscape. This sentiment is echoed by Woldendorp's references to the sharp sense of self found through being alone in the bush. That Truchanas, Dombrovskis and Woldendorp became specialist environmental photographers resulted from their awareness of the country's extraordinary and distinctive ecology, and the sense that their fellow citizens took it all for granted or were indifferent. Each became a pictorial witness for the environment and a proselytiser to his fellow citizens. Their vehicle, for the most part, was not art exhibitions but publication. All worked in both black and white and colour, but Dombrovskis and Woldendorp truly orchestrated in colour, the format which became the new language of the mass media from the 1960s. There were of course local naturalists in Australia arguing the case for public respect and stewardship for the environment, and other dedicated landscape photographers both native born and immigrant. Anglo-Swedish Axel Poignant (1906-1986), for example, an associate of naturalist Vincent Serventy, was working in Australia from the late 1930s to the 1950s and had a special feel for fauna. From the late 1950s Wesley Stacey learnt to love the bush and riverways; in the 1970s he began the journeys across the land that resulted in his transcontinental landscape sequences of the late 1980s. These environmentally-inspired photographers are distinct from equally fine and passionate landscape photographers such as David Moore (1927-2003), who worked in both colour and black and white, but whose involvement with natural history per se and bush treks was less intense. What Truchanas and Dombrovskis discovered in publishing was that photography could bring reports back from the interior and persuade an audience to belief and action. Ironically, while picture magazines like Life internationally and Walkabout in Australia were failing in the early 1970s as they lost revenue to television, new markets were opening up for illustrated books and the power of the 'speaking picture' actually increased. Standing behind any discussion of the work of Peter Dombrovskis and its relation to environmental action—and indeed, of the role of photography from the 1960s—is the phenomenal American best seller, In Wildness Is the Preservation of the World, illustrated with high-quality colour reproductions of photographs by American naturalist and photographer Eliot Porter. Driven by the vision and design of David Brower, the book was published by the Sierra Club of California in 1962 and went on to be reprinted almost continuously for the next twenty years. Porter had trained as a doctor, but as a child had been inducted as a 'Darwinian' by his father on their nature walks and expeditions in Maine. Porter began photographing to record the marvel of ornithology, in which he was expert. He moved to colour photography—using the laborious dye transfer process ahead of most of his generation in the 1940s and 1950—out of his desire to do justice to the jewel-like variety of pattern and hue in the natural spectrum. In Wildness paired Porter's finely detailed, mostly close-up nature studies with quotations from Walden, the classic book of meditations on a specific locale by nineteenth-century pioneer ecologist and writer, Henry David Thoreau. Porter saw with the eyes of a naturalist: teasing out relationships and overlays of co-existing habitats, and the adaptations of flora and fauna. Brower, however, also recognised that Porter's work was 'symbolic art'. Porter went on to be actively involved in preservation campaigns in the American Southwest. He also asserted that his work was not about conservation, despite its use in campaigns—it was independent art. In Wildness became synonymous with wilderness preservation campaigns in the American West even though its contents addressed the temperate East Coast woods of Thoreau's home. As the American ecological writer Rebecca Solnit later wrote, 'The book combined childhood wonder, modernist art, breakthrough color-photography technology, scientific acumen, and political awareness—a convergence that Porter and his editor, Sierra Club executive director David Brower, would refine through subsequent books and years.' And indeed from the 1960s to the 1980s people were turned on to environmental issues and photography in equal measure by the high-quality photopublishing of the period. In black and white the work of Ansel Adams, especially his large-format books and brilliant large silver prints of the 1970s and 1980s, indelibly marked the consciousness of a generation who also now recognised that photography should be preserved and valued as an art. In Australia too the 1960s saw new styles of publishing and new landscape photography. Frank Hurley's picture books had dominated the Australian market from the 1940s till his death in 1962, but a younger generation tired of the picturesque and pastoralist hymn to progress that shaped Hurley's vision of Australia. There was a new interest in the outback, Indigenous culture and desert wilderness, expressed in the launching of the television program The Big Country in 1960. Richard Woldendorp was one of two landscape photographers included in a seminal 1969 coffee-table book on the arts in Australia called In the Making, which presented wilder, more expansive and expressive views of landscape. He had already turned to publishing books himself, The Hidden Face of Australia in 1968 and A Million Square in 1969, which sought to reveal the unknown aspects of the continent to Australians as much as to those outside. Peter Dombrovskis began publishing in 1973 with a pictorial calendar; the first wilderness diary followed in 1976 and the first book, The Quiet Land, in 1977. After the death of Truchanas, who could enthuse audiences with his words as well as his images at his famous slide evenings, Dombrovskis realised that the mantle of consciousness raising had passed to him. But he knew he would need to make his pictures speak for him. Dombrovskis adopted large-format work whereas Truchanas had used mostly 35mm, which suited magazines and smaller books but would not compete with the standards set by American wilderness movement publications. His own wilderness movement book with Bob Brown, Wild Rivers of 1983, marked a personal milestone and a wider political milestone for a generation. 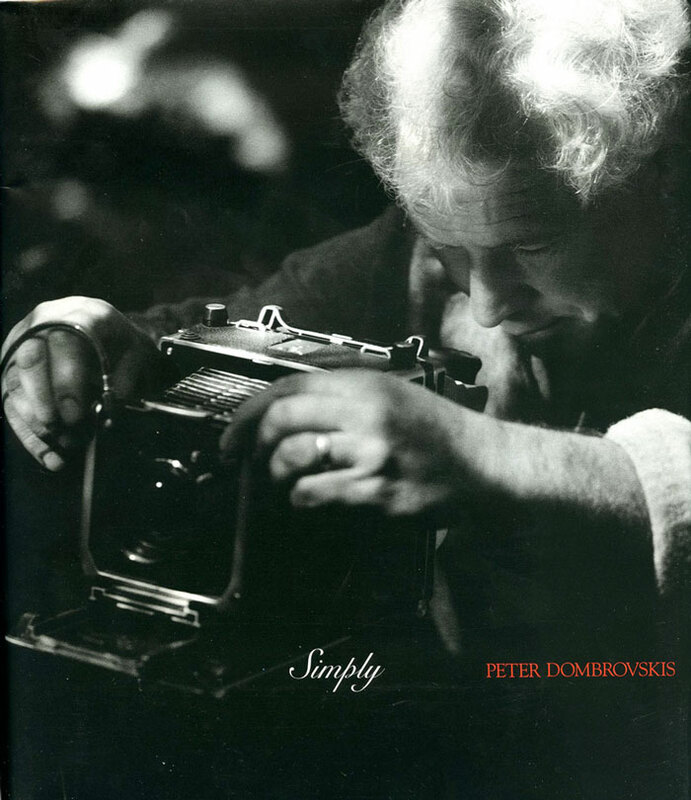 An important factor by now was Dombrovskis's association with master printer Rod Poole in Melbourne, who became a key contributor to the projects undertaken in his lifetime—and posthumously, up to and including the present publication, by Peter's wife Liz through the family company, West Wind Press. These books all sold well and are now expensive and sought after. The sales revealed a hunger for modern images of the land, distinct from the picturesque and pastoral images of outback life favoured by earlier photographers. The 1960s marked a changing of the guard. The current level of public appreciation and awareness of landscape photography, and of the oeuvres of Dombrovskis and Woldendorp, is inseparable from the huge increase in the richness, fidelity and resolution of most colour printing and reproduction since the 1980s—and exponentially over the past decade. While sales of original art-prints have become a feature of the market since the 1990s, neither photographer exhibited much. Any surviving early exhibition prints tend to be disappointing in terms of how far they could reveal the far superior register of the colour films themselves. Although for decades truly skilled printers (like Rod Poole) have been able to achieve wonderful fidelity and quality, the muddy reproductions of most publications before the 1980s break the heart of connoisseurs of photographic art. The premature deaths, both while on photographic trips, of Truchanas in 1972 and Dombrovskis in 1996, ended their image making per se. But the effect of their work remains at large, being constantly renewed, invigorated and extended by posthumous publications. Indeed their images have had a 'second coming' as it has become possible in recent years to produce finer quality prints and reproductions than anything available in their lifetimes. This is because over the last decades of the twentieth century the technology of reproduction and colour printing finally achieved the capacity to match the resolution of the original films and lenses. It is serendipitous that the rainbow was the flag of the youthful counterculture, grounded in environmental awareness, of the 1960s and 1970s, for from that era colour—in magazines, on television, in modern dyes and mass production—dominates media and consciousness. Woldendorp continues actively working in the 2000s making exhibition colour prints of a new scale and majesty. Few Australian landscape photographs have become icons. 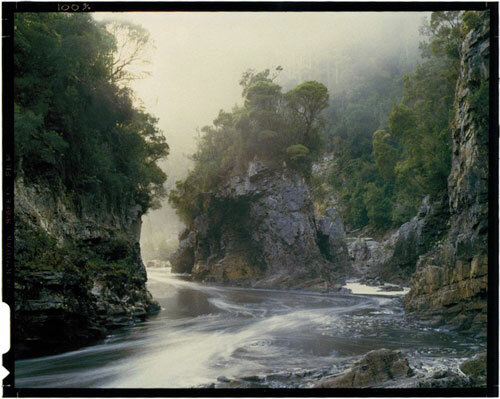 But Dombrovskis's colour photograph of Morning mist, Rock Island Bend, taken in 1979 on the Franklin in Tasmania's southwest wilderness, is undisputed as a symbol of a place, an era and an ethical dream. At the request of a mate, the activist Bob Brown, the artist rendered up the image for use as the virtual logo of the political campaign to save the Franklin River. In the 1970s the river and the region were facing destruction, destined to be sacrificed to a dam for hydro-electric power like the earlier scenic wonder, Lake Pedder. Brown first published Rock Island Bend as the attachment to a letter to The Australian newspaper. It was run as a full-page advertisement and poster image just before the 1983 election under the slogan 'Could you vote for a party that would destroy this?'. Bob Brown had picked the Rock Island image instantly as the one that would convey the meaning of the campaign. That campaign succeeded, thus protecting the Tasmanian Wilderness World Heritage Area that had been inscribed on the World Heritage List in 1982, and including the Franklin-Gordon Wild Rivers National Park, along with Cradle Mountain-Lake St Clair and Southwest National Parks. The story is now legendary. Why, out of many images to choose from, did Rock Island Bend fit the bill in Brown's eyes? One cannot discount the legacy of the Tasmanian artists and photographers who had for over a century explored the land. While Brown was a newcomer to Hobart, both he and Dombrovskis would have had some familiarity with the images of earlier photographers like J. W Beattie and Steven Spurling II at the turn of the century, whose magisterial views had a classical straight-on perspective and gravitas. These characteristics were due in part to the limitations of their plates, which lacked full sensitivity to the spectrum. The idea of artists as trekkers to the wilderness had also been established by painters such as W C. Piguenit, the first to monumentalise the wild landscape of Tasmania. Many other enthusiasts for 'Tasmaniana', such as several generations of the talented Allport family (including early artist Mary Morton Allport), provide a context that helped shape the aesthetic shared by Brown and Dombrovskis and their contemporaries in Tasmania. On a simple level Rock Island Bend, as a horizontal image, was well suited to a banner, and it provided an encompassing view in a region so densely forested as to make open vantage points difficult to find. Indeed its open foreground has a certain theatricality—as if the curtains were drawn back on a stage as a performance for the viewer, who seems effortlessly placed in the front row. The boiling, swirling water sweeping past and round the obdurate and resisting island evoked the resistance of the protesters but also the relentlessness of the flow, which is indifferent to any human intervention. This river, the picture seems to say, is bigger than the viewer: it has been flowing for aeons and will go on flowing (if not artificially tamed by a dam, that is). Despite the recognisable Australian bush, the scene at Rock Island Bend seems as if it could equally be out of some dark northern European fairy tale. Few will go there, it is always difficult to photograph and film. The place remains dangerous, and is often drenched in rain, giving force to the full meaning of 'wild'—it will never be a tourist arcadia like Yosemite Valley in California. Like the heroes of fairy tales and myth, Dombrovskis and Truchanas go there for us. The image was made on the large-format camera Dombrovskis adopted in 1974, with the capacity for a lot of detail and control of perspective. It allowed him to retain detail in all parts of the image; but this capability of large format also creates a demanding challenge if any overall composition is to be made the framework for this density of detail. Peter Dombrovskis's oeuvre is fully resolved by the late 1970s. His signature style is a controlled patterning of tempered colour—details as richly patterned as an old brocade fabric. His is for the most part an intimate viewpoint, rarely as distant from engaging with the physicality of nature as can be the case with Ansel Adams, nor as lost in layers of detail as Porter. In Adams' images the world seems fixed after some dramatic creation but Nature in Dombrovskis's world-view is animist, in essence a conjunction of hard forms and tumbling, swirling energy. Even rocks and pebbles seem in almost psychedelic motion. If there is an anthropomorphic dimension, it is in the animation of a scene by the sense of a projected but controlled emotion. As his work develops from the 1970s, his sensitivity to how the four edges of the photograph contain an image increases, thus intensifying the impact of the image. The late studies of rocks, pebbles and seaweed plants may be 'still life' studies but they are not nature morte, being notable for their eruptive forms and whorl patterns. There is in their organic and loosely repeated form something of the pagan runic script. By bending elements of the great American landscape photographers of wilderness, Dombrovskis extracted qualities to suit his own needs and the expression of an Australian environment. From Ansel Adams came the monumental theatrical viewpoints with their grid of horizontal and vertical structures, but with less of the older man's modernist abstraction of planes and voids. From the gentle monochrome mists and mysticism of Paul Caponigro came references to time through exposures which didn't quite stop the flow of water leaving a ghostly ether in its place. From the 1930s and 1940s work of Edward Weston in California came the vitalist animation of rhythms in nature, and from his son Brett Weston came exquisite calligraphy of yin and yang forms in dialogue. But Dombrovskis's great inspiration and spiritual kinship must be with Eliot Porter's finessing of the interdependent relationship between geology and biology. Porter made landscapes to demonstrate that interdependence and evolutionary success. This was perhaps an unconscious message for a world over which hung the real threat of total nuclear destruction. Porter is maternal; one looks at the fragility of many of his scenes and the urgency of preservation is immediately perceived. There is in Dombrovskis less of the intricate layering of Porter and a good measure of the robust animism of Edward Weston. These are not simple borrowings. Dombrovskis responds to the nature of the landscape he faces. It is not the gentle world of Porter. In 2003, Peter Dombrovskis was inducted into the International Photography Hall of Fame, the first Australian to join a very select band that includes only Ansel Adams and Edward Weston of those discussed above. It was a fitting recognition of the stature he had attained, and reflected the enormous respect of his peers. It may seem surprising that a young naturalist, keen to make his way in the world of science, would be so smitten by a place in the Antipodes. Yet he was, and his emigration fantasy persisted long after his return home. Perhaps what attracted him was not just what he said about the island's pleasant climate and aspect but what he felt in the Tasmanian landscape—what the Romans called the genius loci (latin for the spirit/s of a region or specific site) and the Welsh call heirath, a primal bonding giving rise to the certainty that you can be, or are, at home in a given place. Others before and since have felt that pull. Peter Domhrovskis felt it but his good fortune was the ability to give expression to the complexities of a journey that was personal, political and communal. It was perhaps also his gift back to his mother Adele. She had shepherded him safely out of war-ravaged Europe and found a new home that, in its alpine grandeur, superseded the more homely landscapes of Latvia to which she could never return, and which her family could never leave to visit her in Australia. One thinks of the fragility of their little family unit travelling to the Antipodes. But more extraordinary is the image of the pair bushwalking the Overland Track when he was 13. She imbued him with his love of the natural world and respect for its spirit.